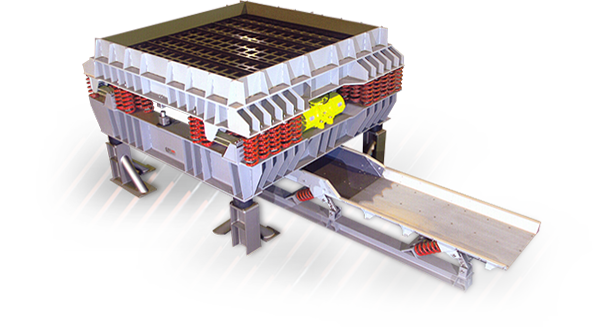 Carrier non-conveying shakeouts efficiently shake out castings and reduce sand lump size. These no-bake and flask shakeout machines utilize a vibratory motion to separate the sand from the castings, allowing sand to pass through a perforated deck. 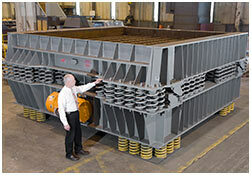 The large, non-conveying shakeout significantly reduces your foundry’s shakeout time and labor. Equipment is built to handle up 100 ton loads. Heavy duty components for long life and low maintenance. Workable area of 14 feet by 14 feet in a single unit. Drive system capable of handling upset conditions. Multiple design configurations available, including low headroom. Isolated design for low dynamic reactions.